When you think of Revolutionary War heroes, the name Molly Pitcher probably doesn't enter your mind. In fact, if you're like me, you've never even heard of her. 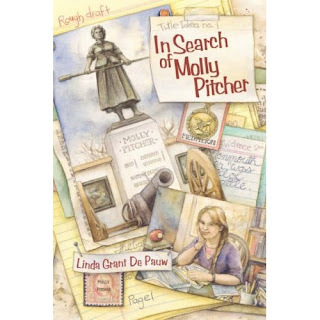 If that's the case, do yourself a favor and pick up Linda Grant De Pauw's In Search of Molly Pitcher. You'll be hooked from the first page. The story follows 12-year-old Peggy McAllister, an overachiever on a mission to win the Rattletop Award. Each year, the prize is given to an eighth grader who shows excellence in social studies. So, when Peggy's teacher announces that each student will be writing a research paper, which can then be entered into the contest, she vows to craft a paper that will wow the judges. Her classmates choose the same old standbys - Thomas Jefferson, Neil Armstrong, Harriet Tubman - but Peggy knows she needs a subject that will stand out. So, against her teacher's recommendation, she chooses Molly Pitcher. Little is known about the woman who took over at the cannon when her husband was killed during the Battle of Monmouth. According to legend, she received the nickname "Molly Pitcher" because she carried a pitcher of water to thirsty soldiers. Thus, Peggy finds herself researching various women, all of whom could be the famous heroine. It's a frustrating quest, but it's also the perfect challenge for the determined Peggy. With the help of her Greatgramps, a retired private eye; and an eccentric writer named Mrs. Spinner, she digs into the mystery with relish. If she can just find some real evidence, she knows the Rattletop Award will be hers. As she searches diaries, newspapers and other sources, Peggy runs into roadblock after roadblock. By the time her paper is due, Peggy has enough information to write her own book, but can she pull it together enough to win the award? Can she even prove that Molly Pitcher was real? Or will her search for answers end in even more questions? Although the book sometimes feels more like a manual on "How to Write a Research Paper," In Search of Molly Pitcher is an entertaining little mystery. The characters are unique and interesting. Nerds everywhere will love Peggy, an unpopular girl who refuses to submit to the mediocrity her teacher demands. My personal favorite is Greatgramps, a feisty senior citizen who drives (only if his destination is less than 3 miles roundtrip) an old VW decorated with bumper stickers that must always be "balanced" (like his "I Love Jesus" sticker, which is tempered by one that declares "Born Again Pagan"). Molly Pitcher, of course, becomes one of the main characters as well. Her story (or legend) makes her just as fascinating as Peggy and her contemporaries. While the story gets a bit bogged down with research procedures and facts, the characters save it from becoming too dull. You'll be drawn to Peggy & Co. as they play detective to unearth the truth behind one of history's most elusive women. Very interesting. I like books that challenge and research historical fact. Maybe that is because I came from the generation that had history books with "facts" such as Betsy Ross making the flag and the "Cherry Tree" story. LOL - this one was a fun read. It's not the best book ever written, but it's quick and enjoyable.